Magoosh is known for its user-friendly interface as well as its unbeatable pricing. It is designed for the self-motivated, busy, budget-conscious student who needs a lot of flexibility and unlimited access. The Magoosh ACT prep course is an entirely online, self-paced course with one-month, three-month, and twelve-month plans. With Magoosh, you can study anytime, anywhere, as long as you have Internet access. With their score guarantee, low price, and extreme flexibility, the Magoosh ACT prep courses are an excellent option. 7. Email and Chat Access to ACT Experts. 8. 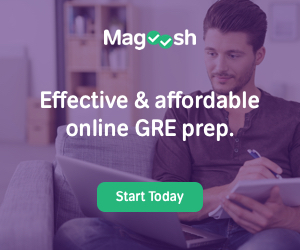 Magoosh GMAT Score Guarantee. If you are a last-minute studier or want a quick brush up, Magoosh offers their entire course free for four weeks. This is also a good option if you would like to try out the course for an extended period of time. The only thing that isn’t included in the 28-day course is the score guarantee but you have full access to all of their study materials. Most of their competitors only offer a seven-day trial. Magoosh is known in the test-prep industry as a low-priced option with a high-quality, user-friendly experience. The Magoosh ACT prep courses are no exception. Aside from the 4-week free option, there is also a 3-month course for $89 and a 12-month course for $99. You are likely not going to find a full-service online course for a lower price. 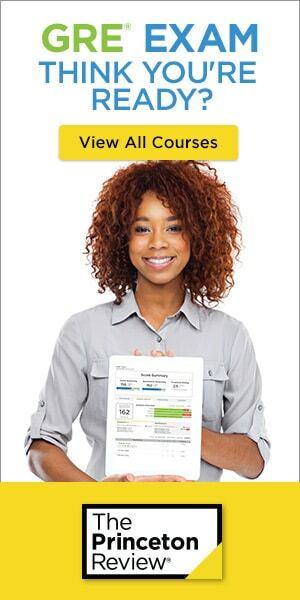 Both paid options offer their 4-point score improvement guarantee and complete access to all of their ACT study materials. They also offer an option of purchasing the ACT and SAT courses (or any group of test prep courses) together at a discount. Between school, extracurriculars, work, and your social life, there isn’t much room for an ACT course. 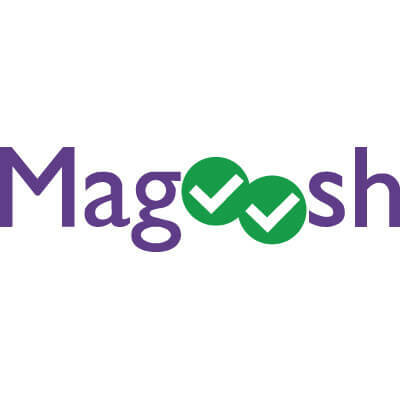 Because Magoosh is completely online and self-paced, it is flexible and can work around any busy student’s schedule. Magoosh will help you set up a study schedule, which will help with accountability and study tracking. They have targeted study schedules and weekly study planners that will help you stay on track. The schedules are customizable to your availability and skill level, so you aren’t studying what you don’t need to study. When you sign up for a course, Magoosh’s site will ask you about your schedule. They will then send you a text message to remind you to study at the predetermined time. The course also offers study schedules with a list of recommended materials and task checklists to keep you motivated and on task. Each Magoosh ACT course offers over 250 lessons and 1350 practice questions, as well as several full-length tests. Each course is designed to improve your performance quickly, by giving you questions that are effective and commonly misunderstood. The material is based on analysis of thousands of students before you. They continually update their course materials based on students’ answers. By doing this, they are able to offer you feedback and comparison to the other test-takers before you. For each practice test or practice problem that is offered, Magoosh offers both a video and a text explanation. You are also able to read the transcript of each video. Within each section, you can take notes, bookmark a topic, and ask questions or give feedback to Magoosh ACT experts. You will also see five section-specific practice questions. If the explanation is not enough to clarify the answer and the reasoning behind it, there is a link to related lessons. In the related lessons, you will find videos of the fundamentals of the problem you are working on, making it easy to review the basics at any point, if necessary. Every topic that the ACT covers has an individualized section. Rather than one grammar or reading section, Magoosh’s ACT prep course breaks down testing areas to super specific topic sections. 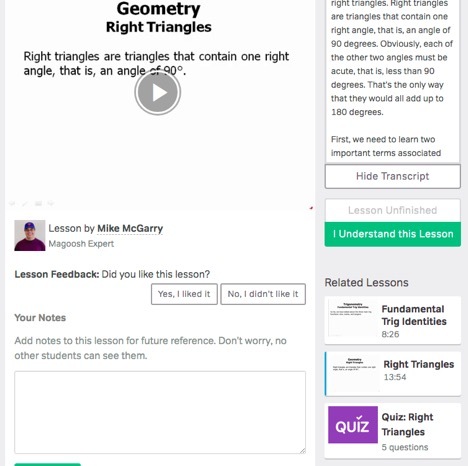 You’ll notice a complete video on topics like dashes, trap answer choices, and right triangles. Within each topic section, you will find a set of questions specifically related to that topic, so you are able to review the individual topic you are struggling on rather than going through an entire broad area to get to the subject you want to study. As you are studying, you can create customized practice sessions. Each session can be filtered by specific topic, length, or difficulty level. You can also decide if you want to study in “practice mode,” where the explanations are shown after each question is answered, or “quiz mode,” where they are not. With this customization, you are studying just what you need to study to be successful. This ability to study exactly what you need to study is one of the best parts of the Magoosh ACT prep courses. There is no time wasted on topics that are already your strengths. Once you have finished a practice study session, you will be able to see an overview of your performance. Within the overview is the difficulty, if you answered correctly, your pace, and a comparison to other students. You will also be able to see any notes you took or if you bookmarked the section. If you have an issue with an explanation or a video, the Magoosh ACT experts are just a chat or an email away. With each course, you have unlimited chat and email access to experts to help you out. This is perfect for when the video or text explanation is just not enough. Magoosh ACT prep courses offer a 4-point score improvement guarantee. If, after taking one of their 3-month or 12-month premium courses, your score doesn’t improve at least four points, they will give you a full refund. Magoosh offers an extensive library of free resources to students and educators alike. Their blog gives plenty of general ACT information, study strategies and tips, college admissions guidelines, and links to other resources. They offer a Math Formula PDF, which is valuable for any student. Even if you don’t choose a Magoosh ACT course, it is probably worth it to spend a little time taking a look at their resources page. The Magoosh ACT prep courses are completely self-paced. This is great if you need the flexibility and don’t have room in your schedule for a class with a set time. It also leaves a lot of room for procrastination and scattered studying. Without an instructor or a set-aside time to be in class (either online or in an actual classroom), some students will struggle to actually study. If you are someone who is self-motivated this might not be a problem. However, if you usually find that you aren’t that good at setting your own deadlines and sticking to a self-determined schedule, you may find that a more guided ACT course is a better fit. If this is the case, take a look at our chart for in person or live online options, like the courses that Princeton Review offers. Unfortunately, the Magoosh ACT prep courses do not offer essay grading services. They will offer some email assistance in writing your essay, but you will not get the feedback and approximate score that other test prep providers offer. In each section, there are a limited number of practice questions, and bout 1500, in the entire course. While you are unlikely to get through all of them, there is a chance that you may exhaust the pool of questions in a specific area. If you are looking for an ACT prep course provider that has more questions, take a look at our chart. Magoosh is vague about how many practice tests they offer. 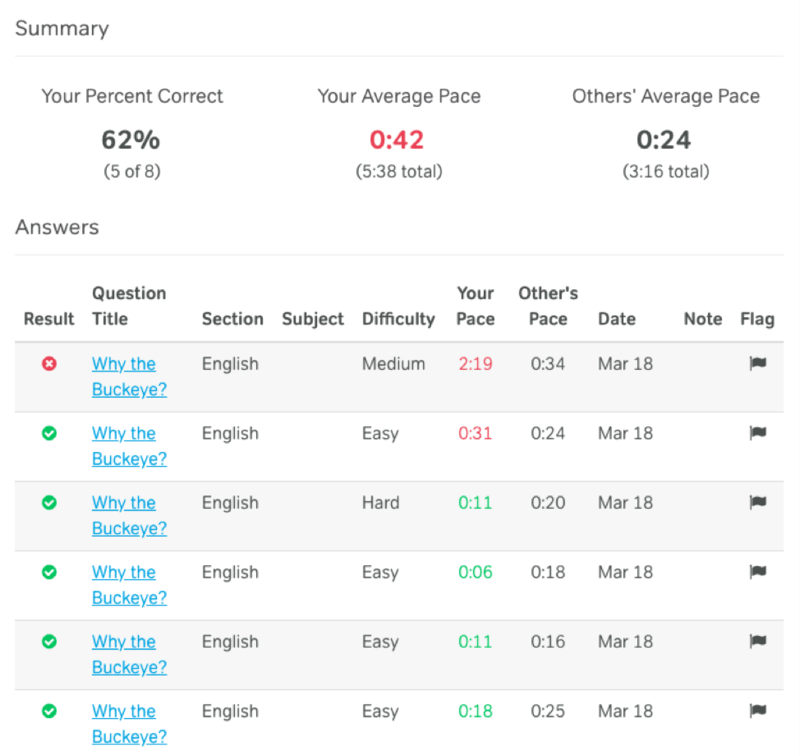 The practice tests are based on your unanswered question pool, so if you use up all of a certain subject’s practice questions, you may not have enough to generate very many practice tests. 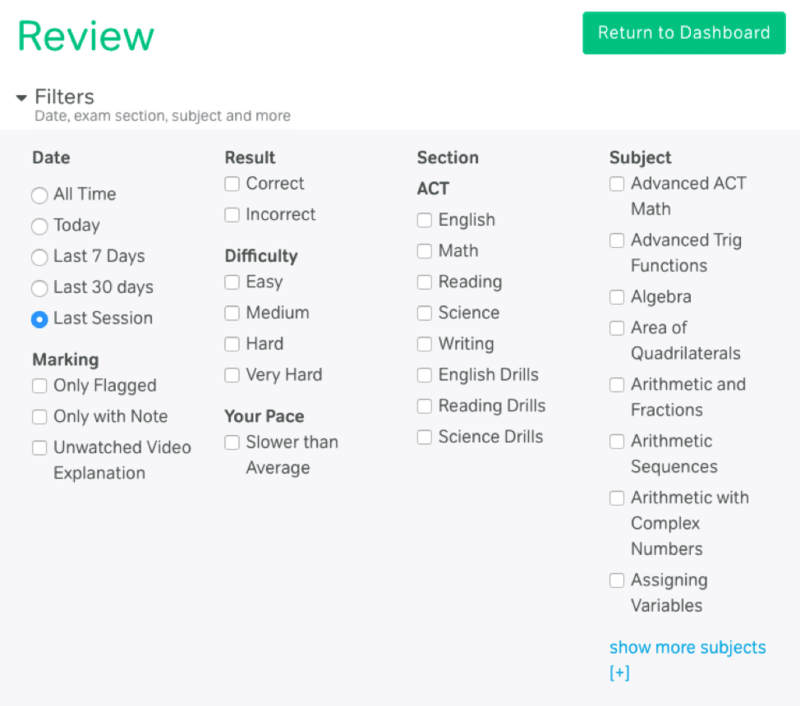 If you want more practice tests in your ACT prep course, take a look at our chart to find a course that works better for you. If you need flexibility and value Magoosh ACT prep is a perfect option for you. The self-paced courses are perfect for the high school student that has a lot of extracurricular activities that are already demanding a lot of their time. Between their readily available app and completely online access, even the busiest student can fit in a Magoosh ACT course. The Magoosh ACT courses are also some of the most budget-friendly courses on the ACT market. If cost is a concern, Magoosh ACT prep courses are definitely worth looking at. If the Magoosh ACT prep courses don’t seem like a good fit, take a look at our chart for an ACT prep course that might work better. TAKE ME TO MAGOOSH ACT!